If Jane and I ever start a band, we can use one of these photos as our album cover. I've not been very good about sewing things for Jane lately. But really, that's ok. Toddlers are crazy hard on their clothes. I don't ever put her in to anything remotely nice when she goes to daycare. You should see the way she comes home. Apparently she plays hard. I always have good intentions about sewing little toddler things. 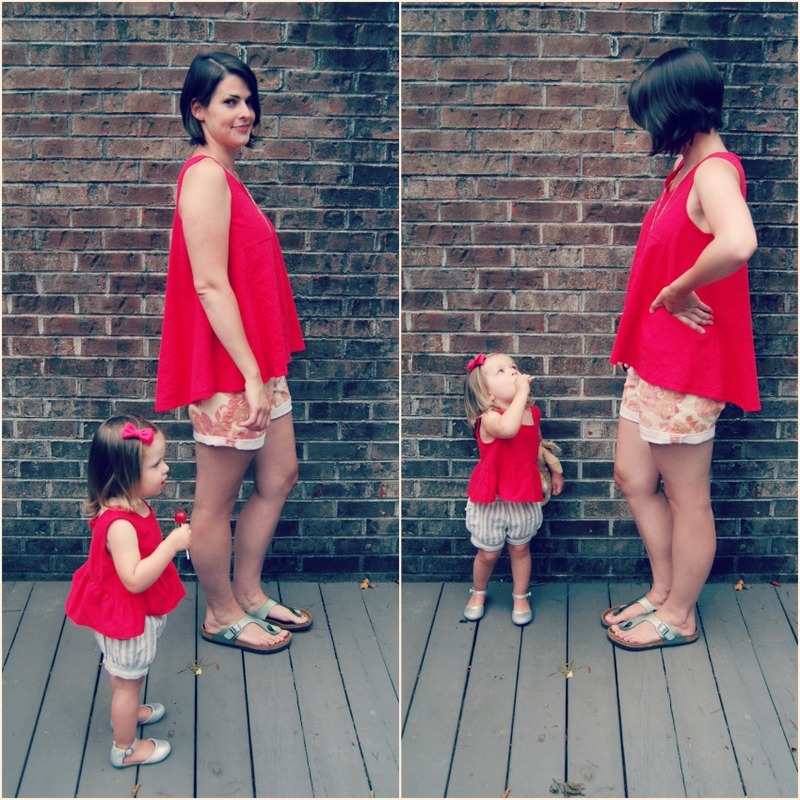 It really is fun and quick to sew toddler sized clothing. Every time I make something for myself, I look at whatever fabric is left and think that I should make something for Jane. Rarely do I follow through. But this time I did. I made up my top first. It's an easy going, swing-y tank. This version is my wearable muslin. 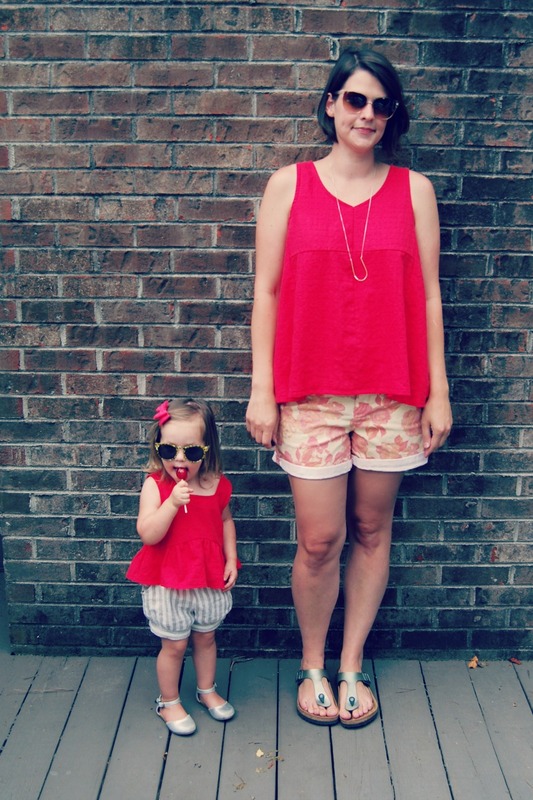 I have a pretty rayon that I want to make this top in, but I didn't want to cut in to it without testing out the pattern first. Here are the pattern deets. Pattern Description: Simplicity 1107. 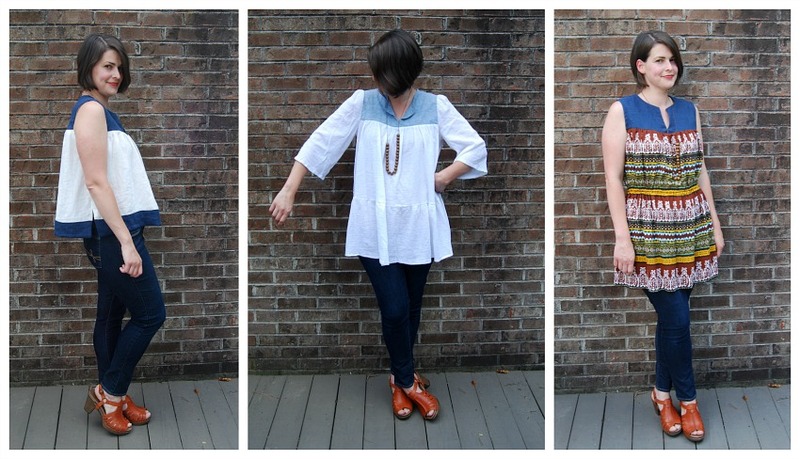 Swing-y high low top,with or without sleeves, that can be made in a variety fabrics. Pattern claims knits or wovens. I used a woven. Pattern Sizing: I made a S, which is crazy. I can't remember the last time I wore anything in a size small. When I looked at the finished measurements there was some obscene amount of ease at the bust. I do realize that this is supposed to be a top without a lot of ease. But I sized down anyway as an experiment. I always have issues with the neckline gaping on things I make. I was curious if sizing down would take care of some of the gaping issues. I figured I could get away with it here because there is so much ease included. See my verdict on sizing down below. Fabric Used: I used a strawberry colored linen blend I found at Joann's as a 'wearable muslin' before I cut in to my nicer fabric. The fabric has a woven check throughout, but I don't think you can see it in these photos. It has a nice texture. I absolutely love this color. It's the perfect coral/poppy red. Likes/Dislikes: I love the v-neck. I also love a swing-y top, as I am sure you can tell. I did have some issues with sizing, specifically at the armholes. But I believe that is because I made a size too small. Conclusion: I might make this again in a fabric with more drape like my original plan. I do like this version a lot, although it's not exactly what I envisioned. It's perfect for the insane heat wave we are having right now. Jane's top is also a new Simplicity pattern. 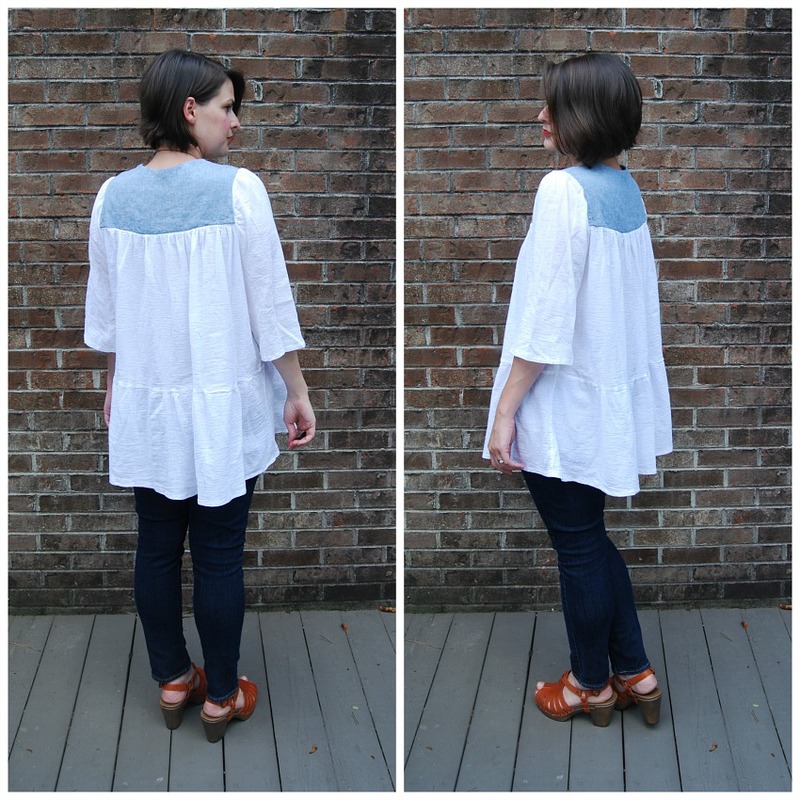 I loved the linen I used for my top so much I wanted to use up the scraps right away. 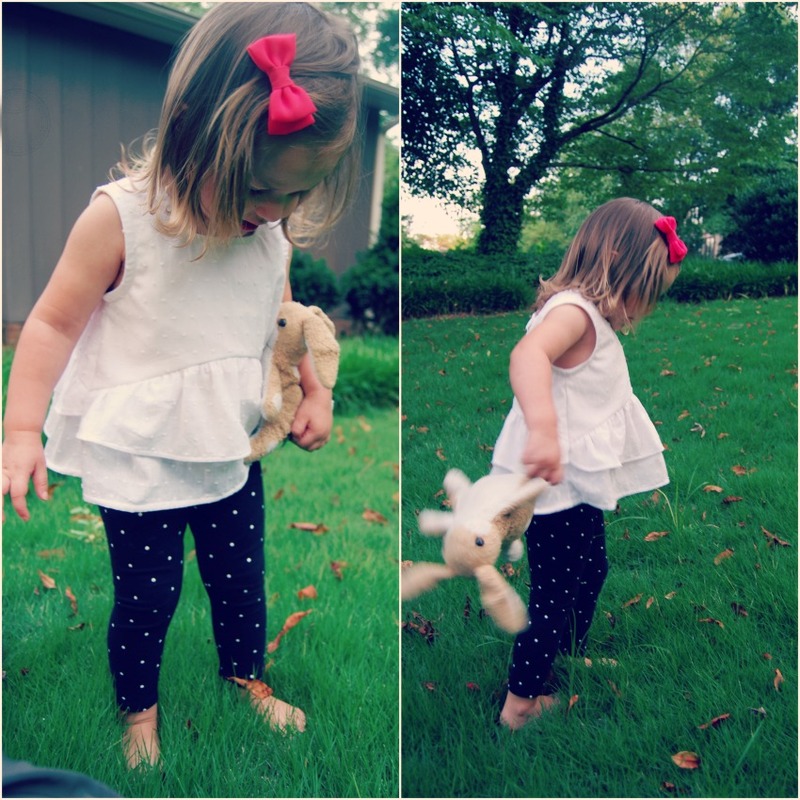 This is a very cute toddler pattern. 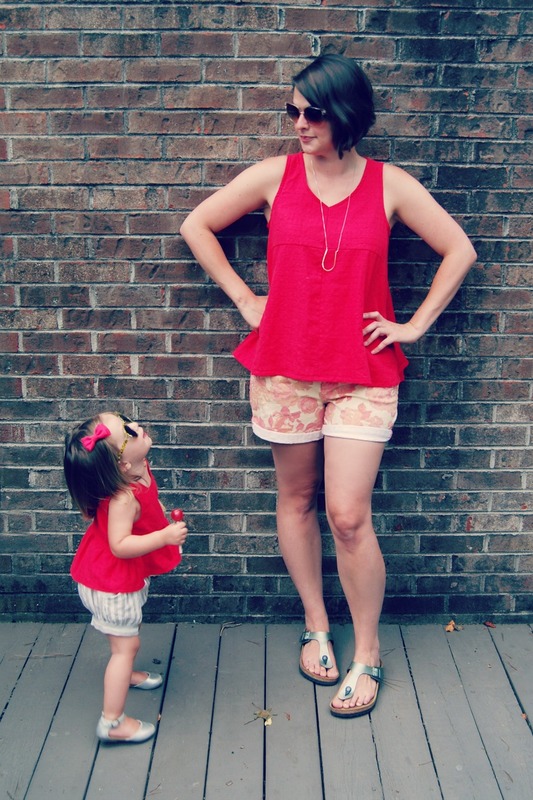 The square neckline, the gathered hem and the bubble shorts are just too adorable. The pattern claims it is an easy sew but I disagree. There was just enough fussiness in this pattern to make it a more difficult sew. Not super hard, but it required some concentration. 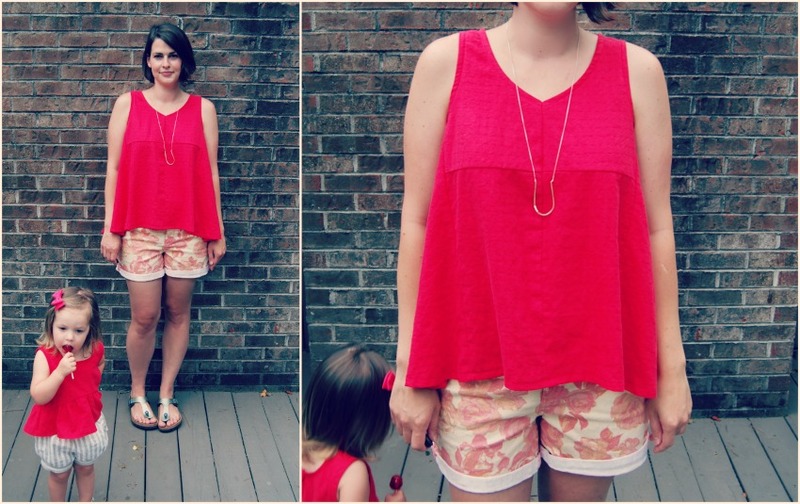 I made Jane's red linen top first. 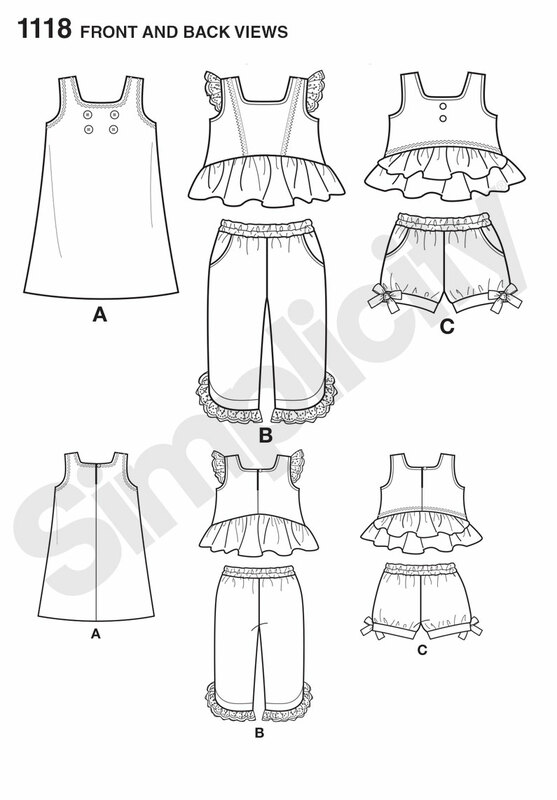 When it turned out well, I went ahead and made the bubble shorts followed by another top in white Swiss dot. 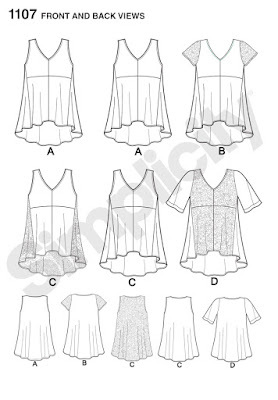 So Jane ended up with three garments from this pattern. 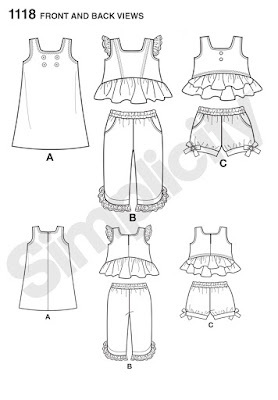 Pattern Description: Simplicity 1118. 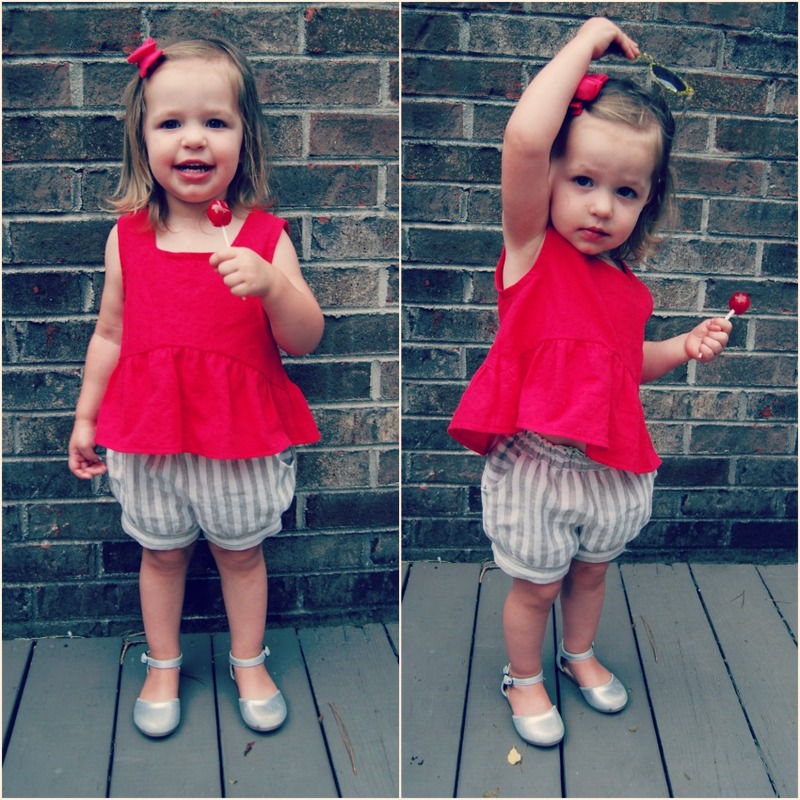 Toddler's tank top with ruffled hem, cropped pants or shorts with bubble hem (gathered in to a band). All cute options. Pattern Sizing. I took Jane's measurements for this. And her measurements crack me up. She is 20" at bust, waist and hip. Ha! So I cut a size two for all pieces. Fabric Used: Linen blend for first top. Swiss dot lined with white linen for second top. And a woven striped linen for the bubble shorts. 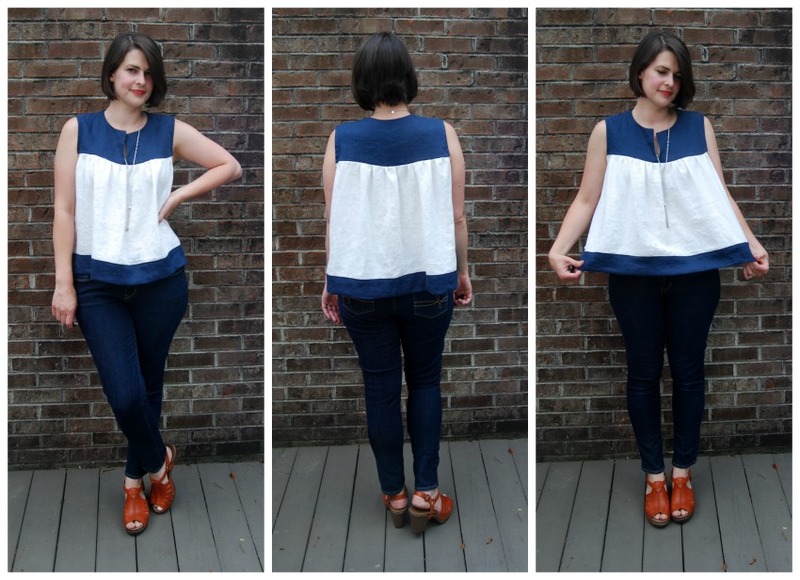 Likes/Dislikes: I love the square neckline. I also love how the top opens/closes with a simple button and loop at the back. That's such an easy closure for a toddler pattern. And practical. The pattern calls for a facing, which I did for the first red linen version. For the white version, I opted to line the entire bodice instead. It worked just fine. If you thought ahead, you could line and finish the armholes in one fell swoop using the burrito method. I didn't think that far through and finished the armholes with bias anyway. It worked ok. I do have some pulling at the armhole because there are so many layers of fabric there. The bubble shorts are adorable. I changed the direction of the stripe on the waistband, pockets and hem bands. They have the cutest shape. I did struggle with gathering the hem of the shorts in to the band evenly. It's such a small circumference that you really have to focus on what you are doing. I ended up with most of my gathering at the back for some reason. It's ok. It's passable. They are absolutely adorable on Jane. 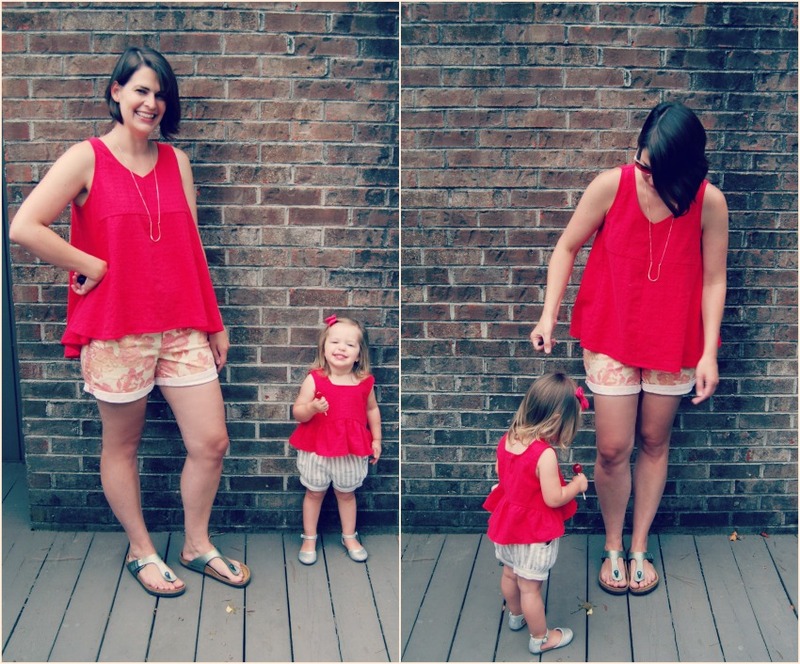 Alterations/Deviations: I made the first red top up exactly as the pattern intended. The neckline is a little too big. On the white Swiss dot version, I raised the neckline by a half inch, front and back. I also added an inch in length to both ruffles so she can wear it for a little while longer. Seems she's growing up versus growing out these days. The shorts were made with no alterations. I know I've said it before, but they are really cute! This. This would be our album cover. Conclusion: Great little pattern. I'd love the make the shorts again as Jane needs a few more pairs of shorts. We'll see how the summer goes. Here is a trio of tops I made at the end of this school year. All three are winners in my book. This should be a really extensive review of this pattern because I made it three times in different views and fabrics. Also, I think I'm going to format my posts in a 'pattern review' sort of format from now on so I make sure I list all crucial info. We'll see how it works. I always appreciate when I google search a pattern and come across a blog post formatted this way. Makes it easy to see info at a glance. So here goes! Pattern Description: McCall's 7095. 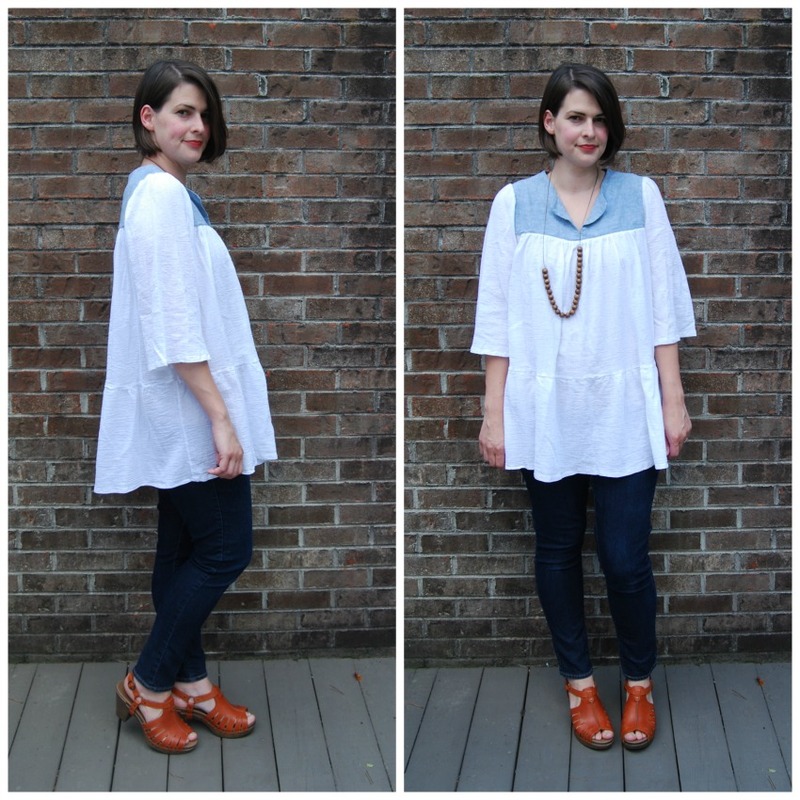 Loose fitting, pullover top with yoke and lots of different options. 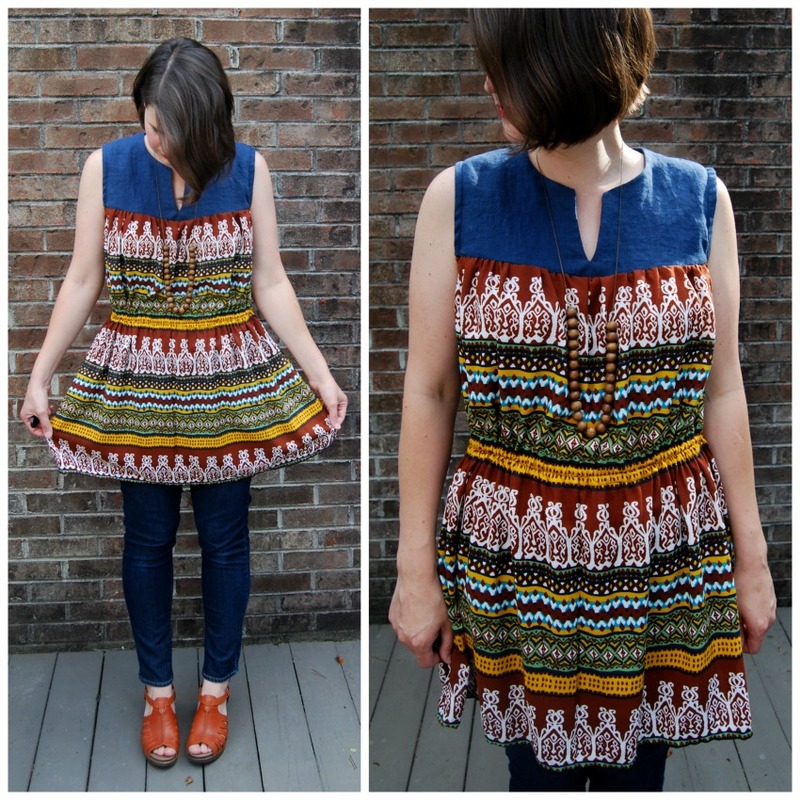 It's a groovy, bohemian smock. Which is exactly what I was looking for. It's a great art teacher top. No, it's not a traditionally 'flattering' silhouette. 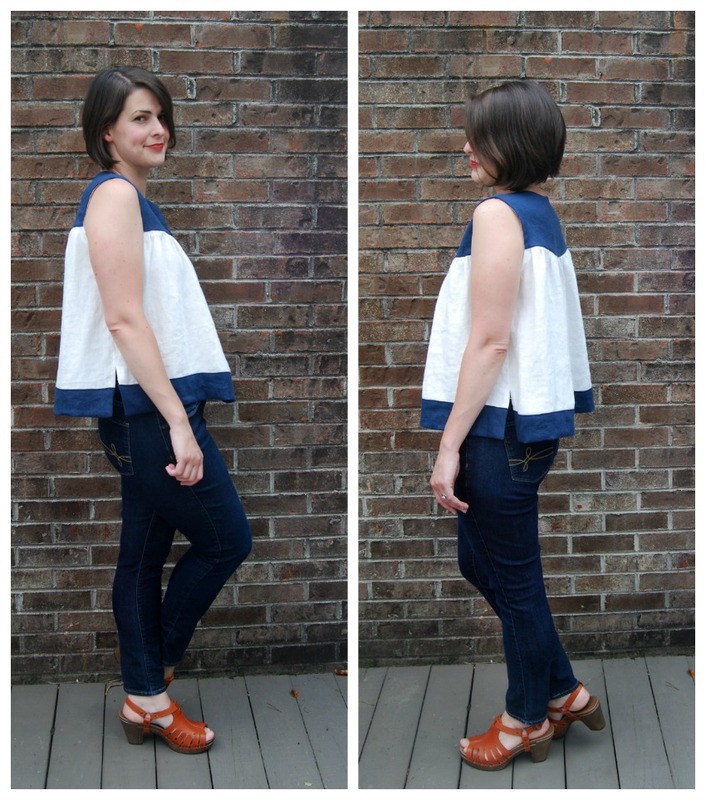 It is a great big, flowy top and I love it. Plenty of ease. 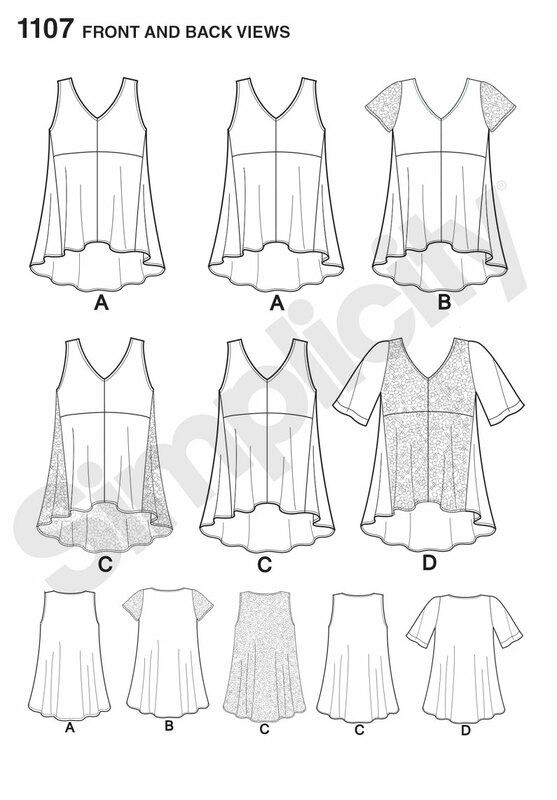 Pattern Sizing: I cut a M. I made some small alterations to the yoke, but really there is not a whole lot to worry about when it comes to sizing. I thought it was true to size. Fabric Used: I made view A in a mid-weight linen, view D in rayon challis and view C in gauze. All three yokes were done in linen. I used the self lined yoke for all three. Likes/Dislikes: I love the self lined yoke. Such a clean way to finish the yoke. I did not try out the collared version, so I can't comment on that. I thought the ratio of gathering in to the yoke was perfect. I did not love the gathered sleeve heads on view C. I think if I made it again I would remove the extra sleeve cap ease and get rid of that gathering. But it does work with the pattern. Alterations/Deviations: I made view A first. I used a heavier linen than is recommended for the pattern. So I opted to crop it shorter. I actually cut the hem at the shortest line, the line for view C where the hem ruffle is attached. Then I attached the hem band differently, cutting a facing as well and attaching it cleanly to the bottom with side splits. The hem band per pattern instructions is actually attached over the bottom part of the top. Phew, that was confusing to write. Hope that made sense. I kind of made it up as I went along. I actually really love this first version, even though it sits far away from the body. It has such a breezy swing. Fun to wear. I did make changes to the yoke after sewing up this version. I actually removed my original yoke and attached a new one after making some changes. I took a 1/2" wedge out of the back neckline as it was too wide and gaped. This made the bottom of the back yoke curve slightly but I left it alone as I figured the curve wouldn't interfere too much with the design. I did straighten the shoulder seams after taking out the wedge. I have no idea if this is a proper way to fix a gaping back neckline. Probably not. But it worked. I am pretty happy with the fit of the yoke after this fix. The neckline sits nice and flat against the back of my neck. I made view D next in a rayon challis. This was my least favorite of the three. Although now that I've looked at photos, I like it more. My biggest complaint is that there is a whole lot of volume to gather in to that elastic waist. I have to shuffle it around when I put it on. I prefer to have most of the gathering pushed towards the back. I may arrange it just right and then sew the elastic in a few places to keep the gathers in the right spot. I also don't like how the elastic waist casing is sewn after the side seams are sewn up. It is a messy way to do it. If I made this view again (and I might!) I would create a seam in the body of the top where I wanted the waist casing to go. That would allow more precision when it comes to sewing the casing. You could even do it within the seam allowances if you wanted. I do love the long length. It could be a mini dress. I'm 5'9" for reference. The elastic casing runs through the yellow stripe, which you can see a little better in the closer photo below. I placed it where I thought it should sit on my waistline. I didn't pay attention to the placement in the pattern, just fyi. I made view C last and it is my favorite. I used a cotton gauze. I made the sleeves just as the pattern intended, but left off the elastic in the sleeve hem. This definitely feels like a groovy, art teacher top. Right up my alley. And like I mentioned before, I am not a huge fan of the gathered sleeve heads. They work in this soft gauze, but any more stiffness and they would look really juvenile, I think. I have the yoke split ironed open in these photos. 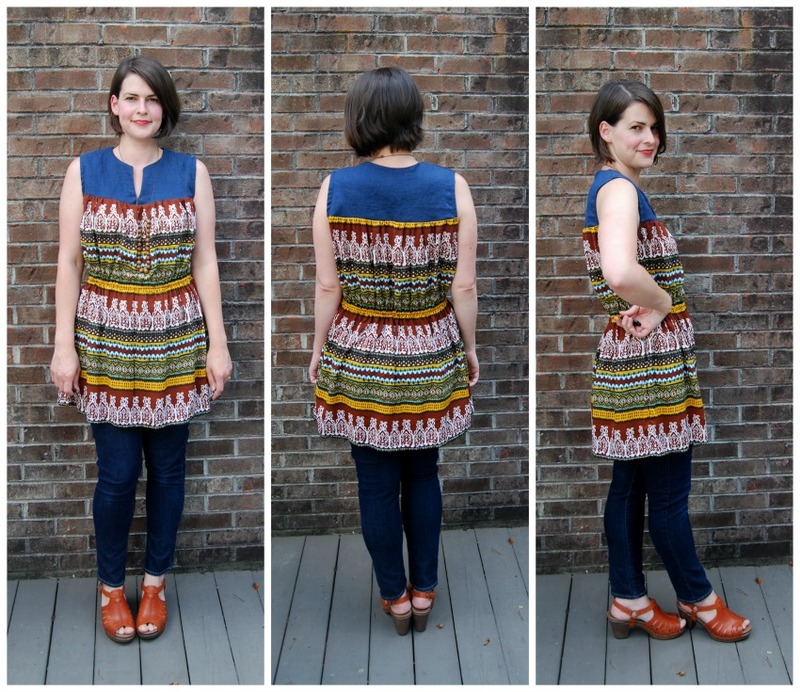 Conclusion: Great, easy pattern if you are looking for funky, bohemian top like this. Lots of options included. I am hanging on to this one. I can see myself coming back to it in the future.